… that would just be strange. But here he is to look at anyway. This is in response to hubby’s latest post. He won’t approve of this, I’m sure, so enjoy it while it’s still here. The Pioneer Woman: First of all, the lady is hilarious. I can’t tell if she’s joking half the time or not (you’ll have to check it out to see what I mean), but it seems as though she used to be a real diva before she settled down and had kids. Now, she spends her time taking care of her family and loves it. She has a few different parts of her site, including a photography section, but the one I’m finding I love the most are her recipes. 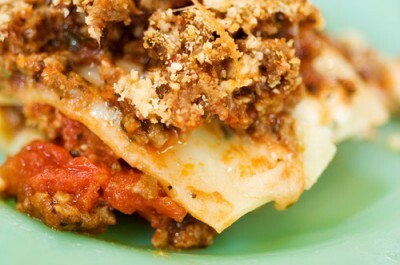 Try her take on lasagna — it really is the best! Cake Wrecks: Lisa showed me this blog and I’ve been cracking up ever since. The commentary isn’t even necessary half the time — the hideous cakes pretty much speak for themselves. Tip Junkie: Whoever runs this one is my new BFF. This is a great source for DIY ideas of all sorts (especially for the scrap booking type), and she always has plenty of contests and giveaways. This fabulous article on being more assertive, written by the inspiring Gala Darling. And while you’re over there, poke around a bit and check out some of the other things this pretty purple-haired lady has been up to — such a fun read. The Maxi Dress (whose name always has me struggling not to stick a “pad” in there somewhere) really has won me over. I think it was Ashlee Simpson that did me in on this one. She just looks too cute. You know, in a hippie, pregnant sort of way. Two Words: Jamba. Juice. I went through a phase where I couldn’t stand the sight of the stuff, but with the revamping of the menu (which slightly confuses me, I have to admit), they brought back an old favorite — the Strawberry Surf Rider (formerly known as the Strawberry Tsunami)… Strawberries, lemonade, peaches, lime sherbet – man, oh man. Oh yeah, here’s buy one, get one free coupon, perfect for a cheap date, yesss. And that would be all for now, my lovelies. What are some things that are making you swoon at the moment? Spill it! We love them, our moms love them, and even our men love them (although they rarely admit it)… And who can blame us? Girl movies are the best! Doesn’t it seem like there’s a movie that was made to correspond with any given mood you’re in? Sappy, cheesy, silly, romantic, girl power-ish… ah, I love them all. On Girls’ Night, we always watch a few movies, eat a ton of junk food (taquitos and guacamole almost always make an appearance), and do mani/pedi’s! What are your top 5 chick flicks? Anyone have a favorite Girl’s Night tradition? Mmm, tea. Whether you prefer it over ice while sitting on your front porch, or steaming hot with honey while reading a good book, you can’t deny it’s the perfect beverage. There are endless varieties and flavors – white, black, green, chai, flavored with syrups and enhanced with fruit – but my absolute favorite way to enjoy it is hot, with one lump of sugar out of a sweet little tea cup. My Grammy started a family tradition of Girl’s Day when I was about 8 years old. Grammy, Mom and I would all get dolled up and have high tea, complete with finger sandwiches and cranberry scones, at the Victoria Rose Cottage. It’s a treasured tradition that we still enjoy today, almost 15 years later. It’s such a delight to sit and visit in such a lovely atmosphere with my two favorite ladies. If you’ve never experienced hot tea, make it a priority! It’s the ultimate, girlie treat. The Republic of Tea is a well known distributor, and offers some very delicious flavors. Ginger Peach is my all-time favorite… I carry a travel size tin in my purse for whenever I need a quick fix. A less-popular, but equally fantastic choice is Culinary Teas. My Mom had me hooked on Caribbean Blue Lady after the first sip.